You know what I can eat by the bowl-full that’s not a dessert? Stuffing. It’s my favorite part of a Thanksgiving or Christmas meal. And do you know what’s even better than the stuffing that comes sealed in a package inside a cardboard box? Trim Healthy Mama stuffing that’s free from sugar and full of energizing carbohydrates. 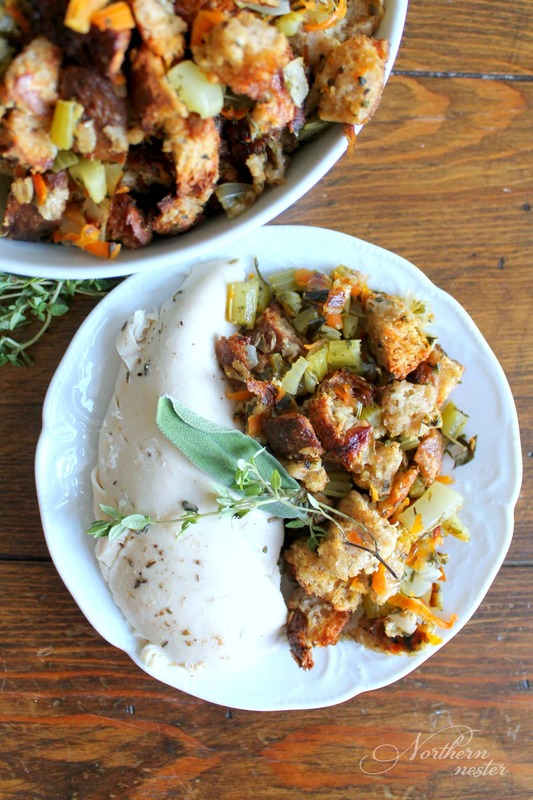 You can pair this stuffing with lean chicken breast for an E meal (I tear apart the breast from a whole roasted chicken for myself and let the rest of the family enjoy a Crossover with the remaining dark meat). A salad or veggie on the side, and a delicious, THM-friendly Swiss Chalet sauce to dip your chicken pieces into, would make a complete, incredible E dinner! Do you know what's better than stuffing that comes from a box? This Trim Healthy Mama stuffing that's free from sugar and full of energizing carbohydrates! A THM E.
Preheat oven to 350 F. In a large pot over medium-high heat, melt butter. Add celery, onion, carrot, salt, and pepper and cook until soft (10-15 minutes). Remove from heat. Add remaining ingredients and stir to combine. Pour onto 2 rimmed cookies sheets and bake for 30-35 minutes, or until some of the bread is slightly crisp on the edges. How much are you using at a time? One cup? I think I had about a 3/4 cup serving with mine. It’s quite filling, since there is so much more to sprouted bread than white bread! Yum! I was raised with stuffing that had sausage in it. You think if I use turkey sausage and rinse it it would keep it an E? Any gluten free options for this? Sprouted bread isn’t gluten free. I was surprised you spread it out on a sheet pan…..I’ve only seen stuffing baked in a casserole dish (if not the stovetop version!). Is this to make it a drier style, rather than wet/blended, I’m guessing? I wonder if you tried it both ways and how they compare? Hi Christine, Since this is an E meal and doesn’t use very much fat, it’s moistened and flavored with the chicken broth. Baking it on cookie sheets dries it out, but not too much. Can this be made ahead of time (I’m thinking 1-3 days and put in fridge or freezer?) I’ve only made-ahead stuffing with store-bought dry cubes or hardened bread. This recipe appears to use the sprouted bread fresh so I didn’t know if the type of bread cube makes a difference. Thanks!! Would the sprouted bread need to sit out for day or two to dry out so it is not mushy? My mom always used Italian bread and did this. She said she tried both. You’ve officially made my hero list! I stopped using boxed stuffing when I took my children off food dyes and high fructose corn syrup (HFCS). Yep, HFCS is even in there. I lamented the loss of such a tasty side dish for my table even more when I went on plan with Trim Healthy Mama & even the non-HFCS versions sold in the store weren’t on plan. Last year, I tried some bogus cauliflower version of stuffing that TOTALLY missed the mark. (Did I mention I didn’t care for it?) I made your stuffing today & had to report to my husband by text message that it’s official! Haha! My 3 year old loves it, and I wouldn’t be afraid to serve this at a family function (I’m regularly harassed as a health nut at family functions.). Plus, I have a new side item to go with my normal rotation of family meals. I used dried seasoning & threw the onions, celery, and carrots in a blender. I prefer the taste of those items over the texture of them chopped, so I nearly puréed them.. I also used reduced sodium, non-fat, sugar free chicken broth. (Have to look out for that these days. Everything has sugar!!) This is so good! Thank you so much for the recipe! Thank you for the great review, Aimee! You totally cracked me up! 😀 So glad it was a hit!! How small is a small loaf? Making this today, for Easter dinner tomorrow. What is your suggestion for the best way to heat this stuffing for the dinner. I have one family member who is gluten free , so he won’t be having any but this also means not adding it to the turkey (the way we used to do it with the box version).